The Ikorodu division of The Mandate Group (TMG), a caucus within the All Progressives Congress (APC), on Saturday passed a vote of confidence on Gov. Akinwunmi Ambode of Lagos State, urging him to go for a second term. 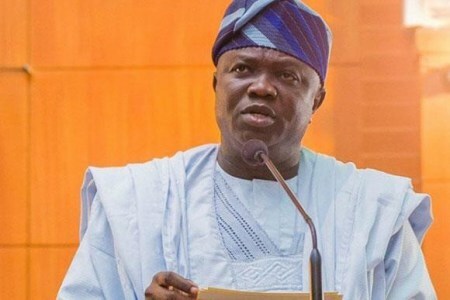 According to the News Agency of Nigeria (NAN), the members of the group in the division, led by Primate Charles Odugbesi, endorsed Ambode at a special assembly in Ikorodu. TMG’s chairmen in the six councils in the division, including Mr. Abiodun Iyiola (Ikorodu North), Mr. Femi Agbi (Ikorodu West) and Mr. Taiwo Longe (Ikorodu Central) were present at the event where Ambode was endorsed via a voice vote. Other chairmen present include Mr. Biliaminu Iyanda (Imota), Mr. Ayodele Adenuga (Ijede) and Mr. Johnson Oloma(Igbogbo Baiyeku). The state chairman of TMG, Mr. Gbenga Arologun, was also present at the assembly with some other members across the state. Odugbesi, at the event, called for the endorsement of Ambode by the group on his impressive performance since he became governor. He stated that the governor has exceeded expectations in infrastructure development, education, healthcare, environment and other sectors of the state. Odugbesi said Ikorodu had particularly benefitted from Ambode‘s development strides through a number of projects. “Governor Ambode has surpassed our expectations. He is delivering good governance and development across the state. “The gale of endorsements for him to seek another term is a testimony people appreciate what he is doing and so want him to do more. “Our group, The Mandate Group within the APC in Ikorodu is pleased with what he has done, especially in this division. “We have therefore endorsed him for another term and urged him to re-contest to do more,” he said. Odugbesi said the group is impressed with the way Ambode is carrying party members along in his programmes and policies, giving everyone a sense of belonging. He pledged TMG’s support for his re-election. On the activities of TMG in the division, he said the group had done a lot to mobilize people for the party. Odugbesi stated that the TMG was working hard for the progress of the party, especially as the 2019 elections were approaching. “TMG is one and we are united to move the party forward in Ikorodu division. “The fact that all the six council chairmen in the division are here together with the state chairman shows that we only have one TMG, and that is the one here. “Any other group claiming TMG executive in Ikorodu is on their own.We are one in TMG and this meeting shows there can be no other recognized TMG in Ikorodu,” he said. Odugbesi pleaded with members of the group to mobilize party members to get their Permanent Voter Cards. That, according to him, is the only way to ensure the victory of APC at the polls.